Children queue up at the UNRWA medical point in Yalda. As the United Nations agency assisting Palestinian refugees in the Middle East continued humanitarian operations in around the Yarmouk Camp, deep concerns remained about violence that continues to profoundly threaten the lives and safety of Palestine refugees. Illustrating the importance of such assistance, UNRWA used their latest day-long trip to Yalda, Babila and Beit Saham to provide essential health services, vaccinations, dental services, fresh water and child nutritional supplements contributed by WFP and UNICEF. At a mobile health point, medical personnel treated 315 patients and found one child under five years old who was moderately malnourished. They also distributed child nutritional supplements, food and medicines. “UNRWA's priority remains the delivery of humanitarian aid to civilians within Yarmouk itself,” said Mr. Gunness, who reiterated the agency's strong demand for respect and compliance with obligations to protect civilians and the establishment of secure conditions under which life-saving humanitarian assistance can be delivered. Those receiving assistance were Palestinian and Syrian families displaced or affected by conflict, plus host communities, and UNRWA continues providing assistance to civilians from Yarmouk who remain displaced in Tadamoun, an area on the north-eastern periphery. UNRWA continues to work closely with partners and UN Agencies to mobilize resources for a large-scale humanitarian response to support the civilians of Yarmouk. Stocks of food, mattresses, blankets, and hygiene kits have been prepositioned to respond in case of further displacements from Yarmouk. The agency has appealed to donors to increase support through its Call for Funds, seeking an immediate injection of $30 million. The UNRWA Syria Crisis Appeal has received only 21 per cent of the funds needed for 2015 and chronic underfunding for humanitarian interventions in Syria continues to undermine the agency's capacity to sustain life-saving emergency interventions. 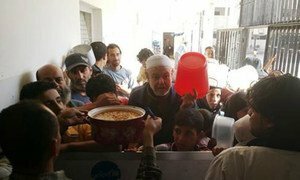 The United Nations Relief and Works Agency for Palestine Refugees in the Near East (UNRWA) has resumed the provision of assistance to people displaced from Yarmouk camp in Syria, a spokesperson for the agency confirmed.